While the university was profoundly affected by the impact of Hurricane Michael and a shooting at a local yoga studio, it also celebrated momentous achievements, such as a jump in the national rankings. 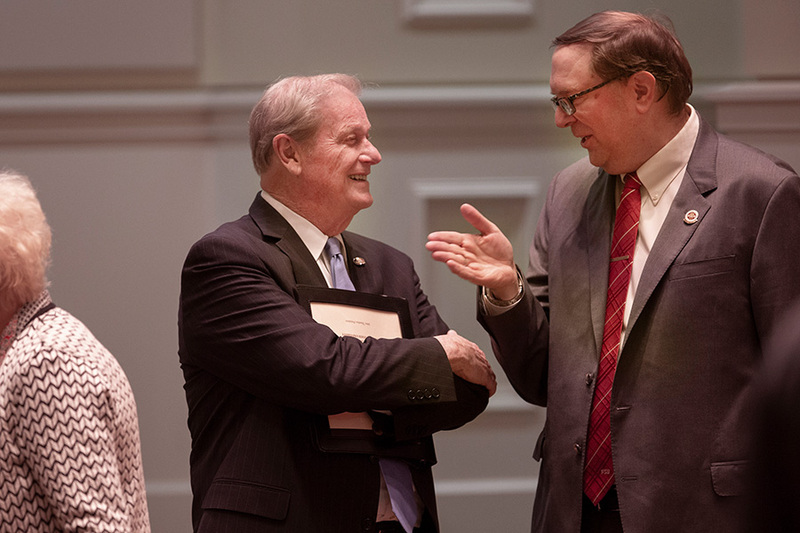 Thrasher recognized Dean Randy Hanna for his extraordinary efforts in the swift reopening of FSU Panama City after the hurricane, he reiterated his commitment to keeping guns off campus, and he gave his assurance that the safety of the campus community is his top priority. “People have a right to feel safe in their schools, in their places of worship, and everywhere they go — the mall, a movie theater, a yoga studio — and certainly on a college campus,” Thrasher said. Thrasher said the challenges of the past year have provided Florida State with an opportunity to see what it is made of, and that same strength has helped FSU to reach unprecedented levels of achievement. In the latest U.S. News and World Report rankings, FSU skyrocketed seven spots to No. 26 among national public universities. It was the biggest single-year improvement in university history. Florida State is actively following the six goals set in the university’s strategic plan launched last year as a road map for the future. “Those goals are at the center of our plan, and we have a committee in place to serve as our compass and a set of metrics to make sure we are going in the right direction,” Thrasher said. FSU’s focus on student success and preparing students for 21st century careers was bolstered by its investment in its faculty this fall. The university welcomed 240 faculty, including 125 positions, which will allow FSU to improve its student-faculty ratio and offer more small classes. Thrasher credited the faculty for creating an environment where students can thrive. FSU is nationally recognized for its student success initiatives, a key reason why more and more students are seeking a Florida State education, Thrasher said. Undergraduate applications are up 14 percent over last year, and graduate applications saw a 26 percent increase from 2017. This year, Florida State celebrated the conclusion of Raise the Torch — the most ambitious fundraising campaign in university history. The campaign raised nearly $1.16 billion in gifts and pledges from donors and supporters upon the campaign’s official closing June 30. More than 1,300 scholarships were created or enhanced, and nearly 100 professorships were generated or supported. Strengthening the excellence of its academic and research programs also is a goal for Florida State, and an area where it saw much success over the past year. FSU faculty researchers received more than $226 million from federal, state and private sources this past fiscal year. In addition, the National Science Foundation granted FSU $184 million over the next five years to continue operating the National High Magnetic Field Laboratory. Florida State’s campus landscape continues to change as well. The construction of the new Earth, Ocean and Atmospheric Science Building is halfway to completion, and the university began a major renovation of Oglesby Union. FSU also opened a new Black Student Union and a new childcare center. This spring, FSU plans to break ground on the Interdisciplinary Research and Commercialization Building on our southwest campus. Diversity and inclusion are a top priority for Thrasher and the university. This year, Insight into Diversity recognized Florida State as a Diversity Champion for the third consecutive year. FSU also received the APLU’s platinum award for Global Learning, Research and Engagement, honoring excellence in integrating global education throughout the university. As the 2019 Florida Legislative Session begins in March, Florida State will request funding in recognition of its preeminence and performance to support the university’s continued efforts to hire world-class faculty and scholars, advance its professional and graduate degree programs, support academic excellence and maintain its facilities. FSU will also ask the Legislature for additional funding for the College of Business Legacy Hall, the Interdisciplinary Research and Commercialization Building, a new STEM Teaching Lab and increased program and building funds for the FAMU-FSU College of Engineering. 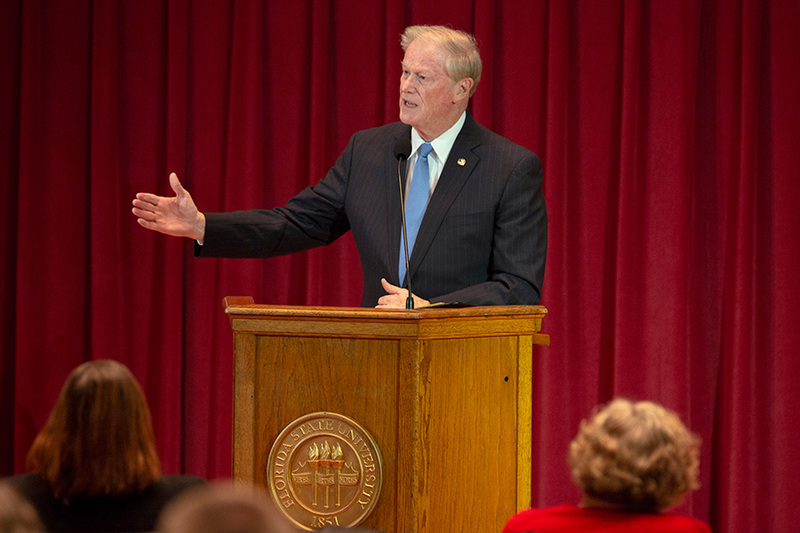 “Our lawmakers know that Florida State is one of the most efficient universities in the country, and they understand that supporting Florida State students and faculty is a wise investment in the future,” Thrasher said. 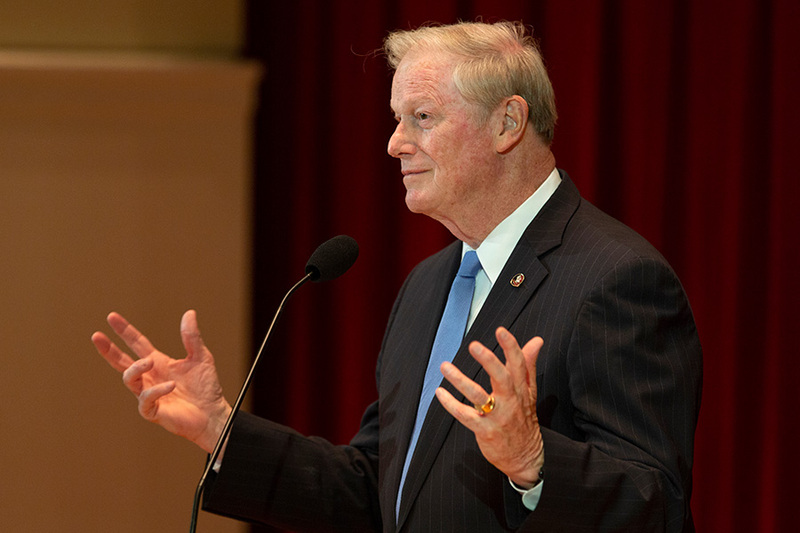 Thrasher said that as Florida State looks to the future, it plans to invest strategically in building upon the university’s rising reputation with increased marketing efforts and communicating its unique strengths to a broad audience.